$2100 for the pair. pair of vintage antique Victorian girandole sconces, c. 1850-1900. sconces each have 7 arms. gilt metal frames with leaded crystals. top finial has scrolls and ends in a large leaf shape. these matching pieces are monumental-sized and would look fabulous framing a fireplace, master bed, or in a large entryway. very good condition. 14.5" deep, 28" wide, 34" tall. delivery available. call lincoln antique mall for more info 773-848-3070. 3115 w irving park rd. open Monday-Saturday 11-7, Sunday 12-6. visit us at lincolnantiquemall.com to see more great items! 7500 square feet of vintage and antiques! voted best antique store in chicago. like us on facebook to see the newest arrivals. WE BUY vintage and antique furniture, chandeliers. $2100 for the pair. 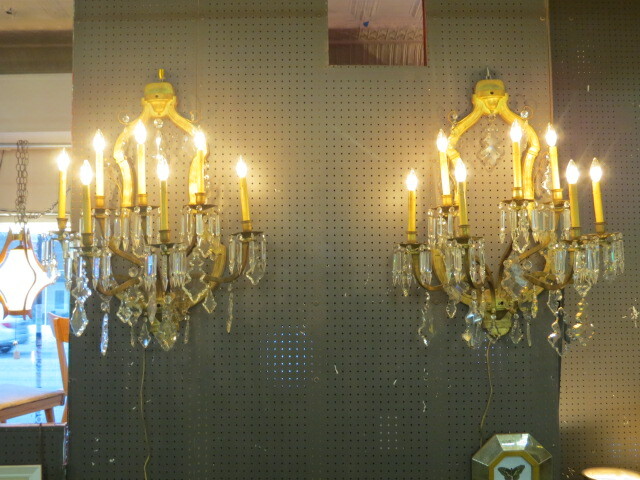 pair of vintage antique Victorian girandole sconces, c. 1850-1900. sconces each have 7 arms. gilt metal frames with leaded crystals. top finial has scrolls and ends in a large leaf shape. these matching pieces are monumental-sized and would look fabulous framing a fireplace, master bed, or in a large entryway. very good condition. 14.5″ deep, 28″ wide, 34″ tall. delivery available. call lincoln antique mall for more info 773-848-3070. 3115 w irving park rd. open Monday-Saturday 11-7, Sunday 12-6. visit us at lincolnantiquemall.com to see more great items! 7500 square feet of vintage and antiques! voted best antique store in chicago. like us on facebook to see the newest arrivals. WE BUY vintage and antique furniture, chandeliers.